I rarely travel on my own, but this past November I made a trip of a lifetime with a journey to England. I did not make any wide announcement about this oversea adventure, but instead kept it quiet, with only a few close friends knowing about my plans. My mission was twofold: to see my first screening of Chaplin films featuring a live orchestra, and to discover more about Edna Purviance. What I returned with was more than just the experience of a terrific live event. I met some very special people. Also, for awhile I was able to be in another country at a time when many Americans are wondering if it is safe to travel, especially to a large city like London. I have been to London three times before, and with each visit, I have found it easier to visit. The first time was the most disorienting! Seeing cars traveling opposite directions, and looking left, when I should be looking right, was only part of the confusion! 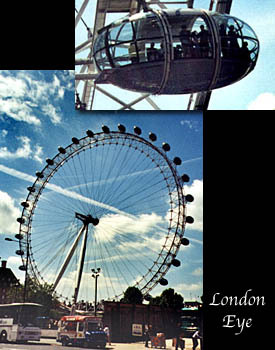 London does not have skyscrapers that are so common in U.S. cities. You dont find avenues of glass towers, but rather the towering Eye, with its glass cars soaring skyward to give you a unique view of a city brimming in history. 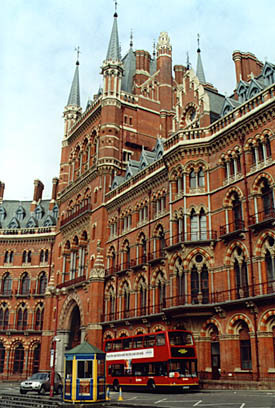 You will find a splendid mix of buildings in Central London, from Victorian to modern. The first time I walked the streets of London, I nearly got whiplash from looking at all the distinctive looking architecture on every street! Londoners see these places every day, and may think of them as a place to just get a magazine or cup of tea. Their minds are filled with their daily life as they look at their watches and hurry to catch a bus! Yes, I saw many of those Londoners thinking Tourist! as I pulled out my camera for the umpteenth time to record yet another mind-boggling sight. Yes, Im a tourist, just as much as a Brit pulling their camera out to photograph the newest Las Vegas mega resort, or trying to cram the whole Grand Canyon into one photo! No different than you. But the UK has something Las Vegas does not, a depth of history. Keep that Las Vegas photo, for that image is fleeting, but your stately British stone buildings are not. Traveling in London is best done on foot, with an assist from the wonderful public transportation system. A Brit might argue that the London transportation system is not wonderful, but in my town in Oregon we dont even have a bus that goes to the airport! Yes, the London public transportation system has and always will have problems, but at least it is there to use when you need it. 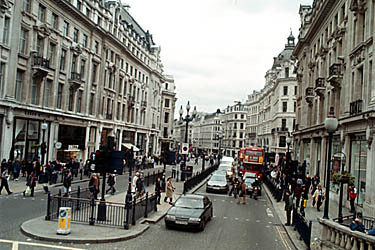 London without the Underground and the buses would be a nearly impossible place to visit. And Londoners know that fact every time the trains stop running! London is a big city with many different kinds of people and with all the problems of any big city. But being aware of your surroundings is the best way to deal with any big city. Travel with purpose and always have your map! Reading maps seems a very British thing to do, especially on the back roads, where many road signs were removed during WWII and never replaced! 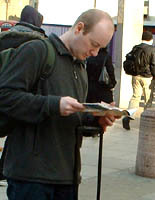 I have not met an UKer yet without a trusty map in hand, in the car or in their home. It just part of life, like having a cup of tea. 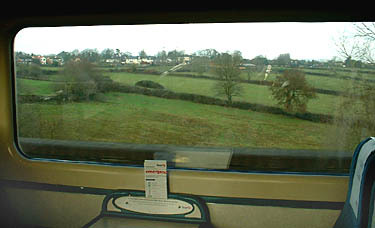 Besides, it can be very confusing walking the streets, or driving the byways of this lush green country. When using the public transit, its best to purchase a travel card that fits your stay. They come in one, two or even seven-day cards. Make sure you purchase one that covers all the zones of travel you plan to visit. Study the maps and note the train stations you will use, and you will be set! And if you have any problems, I have found the staff at the stations more then helpful. Even if your ticket doesnt work at the entry machines, just asked the nearest attendant, show them your valid card, and they will let you through with a polite smile. As least that has been my experience. It is interesting to note that London probably has more security cameras than about any other city in the world. At least if you do get pick-pocketed, you may see it on video later! But in general: keep a low profile, be pleasant, and treat people with respect and you most likely get it in return. As my husband and most of America were asleep with visions of roasted turkeys and holiday football games dancing in their heads, I was starting my first full day on my England adventure! My very first surprise was the weather! After leaving home with a snowstorm, England appeared as a beautiful April day! would impress me throughout the trip. No matter how gray the sky got, the green shone as bright as neon! Only the chilly wind that sometimes blew brought back thoughts of winter. But when the sun did shine, and it shined a lot on my stay, it made any thoughts of winter dash completely away! 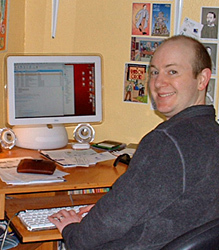 Nov. 2003 -After a busy day, Garen works on his creation Rainbow Orchid (book release with Egmont UK August 2009 with Vol. 1 & Vol. 2 July 2010). My interview with Garen. 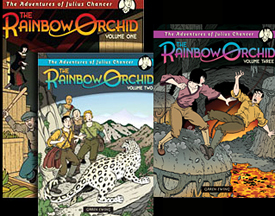 The Rainbow Orchid is a very classy 1920’s comic mystery adventure about a lost mystical orchid in India and the brave crew setting out to find it to save a family fortune and honor. Our London mission was not to find a mystical flower but a nearly mystical collection that has been buried away for a few years after the Moving Pictures Museum closed. The Edna Purviance Collection was in limbo, but luckily I was able to locate it with the help of Janet Corbett of the British Film Institute Museum. She was in charge of the collection when I e-mailed BFI from the States about seeing it. Fortunately, I talked to her in time. 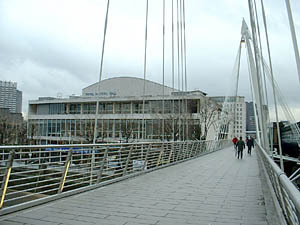 Janet and the collection were in process of moving from the BFI Museum in South Bank to the British Film Library on Stephen Street in Central London. Knowing I was coming from the west coast of America, she held The Edna Collection in reserve for me. And lucky too, Garen Ewing had time available in his busy schedule to see the collection with me. With Garen in control, we plotted the best route through the London streets and Underground to find the BFI Library. It is very nice to have a native to take a farm kid from the plains around the stone canyons that are London. After a couple of train rides and a short walk, we found the massive library building tucked up a short city block called Stephen Street. Once there, we entered and announced our arrival. To our surprise, the BFI staff couldnt locate Janets name, and for a moment I felt our journey might be derailed. We patiently waited as the staff scrambled through phone lists and made several phone calls which finally brought success. 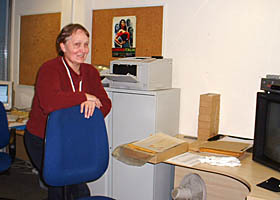 The confusion was due to Janet being new to the staff at the BFI library, (she been working there only a week, after moving from the BFI Museum location). A few minutes later, Janet greeted us at the front desk. Getting fully signed in, with our official badges on, Janet led us to the lift, and we were on our way up to see The Edna Purviance Collection at last! Apologies were many as we entered the office, as Janet regretted the lack of room to see the collection. She and her staff were deeply into moving items over from the museum and space was limited, but we were fine. A niche was created in one corner of her office, just enough room for Garens chair and my own. So with Janet and two other staff working busily in the office doing their daily deeds, Garen and I proceeded to travel back in time through the mystical collection of Edna Purviances personal memorabilia. Now both I and Garen have been wanting to see this collection for several years. Garen waited even longer than I, since he knew about the collection during his early ChaplinUK days. 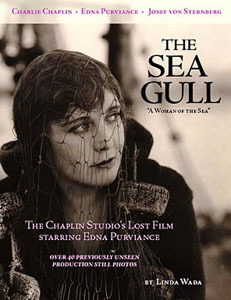 So we both were excited to finally see it, and I was especially pleased to have arranged for Garen's viewing, since he was the person most responsible in encouraging me to place Edna Purviances site on the web in the first place. So this was a special day for me indeed. With our white gloves donned, we proceeded to view the collection. We had received a list of items in the collection beforehand, but the archive was more than I thought it would be. There were lots of stills from Edna later films, A Woman of Paris and Education de Prince. There were a few stills from A Woman of the Sea too. Most we have seen before, but a few we had not. The part I was most interested in was package of uncaptioned photos of unidentified people. After doing so much research on Edna, I was hoping to find pictures of her friends or especially, her mother and sisters. Well, both I and Garen believe we have found one of Ednas sister in that stack! A beautiful girl with features much like Ednas, but not Edna. Personally, I believe it might be Ednas older sister Bessie, but the hard part will be to document the finding. Discovering the image is a great start for further research and was the most exciting find in the unidentified photos. While gingerly digging through the pile, Garen uncovered a document that surprised both of us: a contract between Edna and Sydney Chaplin. Sydney was Ednas personal agent for three years (dated February 1919), something neither of us ever remember reading about before. I have to say with all that mystery writing Garen does with his Rainbow Orchid series, he proved very helpful as we continued through the layers of old documents. Edna last film was 'Education de Prince', which is still shown in France and on video in France in about 1991. Garen uncovered a newspaper article that reported Edna as being cast as Lillian Russell in a 1934 Ziegfeld film to be directed by Lewis Milestone. Later, I looked up Lewis Milestone's filmography and could not find any Ziegfeld films made by him, or any films he made in 1934. We felt it was most interesting that even in 1934, Edna still was looking into acting in films. It is our loss that she never did. "Charlie Chaplin is my mother's only legitimate son"
We both happened onto a faded three-page letter dated 1917 to Miss Edna Purviance. At first we thought it was just another fan letter, as the collection had many. As I continued elsewhere, Garen kept reading. He suddenly realized this was no ordinary fan letter, but the original 1917 letter that Leo Dryden wrote to Edna to introduce himself as Charlie Chaplins half brother. We knew of the letter from David Robinsons book, Chaplin: His Life and Art, but were very moved to see it in person. A very detailed three-page letter all typed, it certainly was a carefully written and well thought out. Edna certainly must have been touched by it, as it easily affected us. There were many odds-and-ends that didnt seem to mean much, but they stuck in my mind after I left the museum. There was list of bills on a worn piece of paper with Ednas father M.G. Purviances name listed for $25, but it was the only one crossed out. Was this the amount of money Edna sent her father every week, or so? There were several cards with the reference Edie. Was this Ednas nickname? Garen and I had different thoughts on that one. Could Mother Superior refer to Charlie, the one always mothering everyone at the studio? Or my immediate thought, was it Ednas mother, Louise. I do know Ednas mother was quite the religious woman, and may have been at odds with some of Ednas more fun-loving playmates. And after seeing the collection of notes, Edna seemed to have quite a tight group of fun loving friends. It was getting late, and we finished viewing the last item just before half past five. We thanked Janet for letting us share her office space and see the collection. She was most kind, and very helpful, as was the whole staff. The collection was not earthshaking, for it had been combed through many times before, but it was interesting to see what one keeps during a life.There were many bits and pieces of paper that seem meaningless to the casual looker, but important enough for Edna to keep through the years. Surely pieces from the collection, like letters, may be in other hands now, as there were many empty envelopes with addresses on them. But it still is interesting to see what is left from her life. Why keep a list of bills with your fathers name on it with $25 crossed out? Could it be that was the last note she wrote to herself about the last check that she sent her father just before he died? It had to mean something of importance to keep for a lifetime. It seems so ordinary, but ordinary things can have so much meaning when the full story is known. Remember Rosebud? For Edna that simple piece of paper truly met something. Like a Brit trying to cram the whole Grand Canyon into one camera frame! It was there, and you want to remember it! So you take the picture and place it in a book to remind you of that moment. But sometimes, it is a simple thing, like a napkin with a note you wrote to yourself, or that little stone you picked up while walking a shoreline, or an item from your past, that meant a turning point in your life. These might have the strongest memories of all! That one item which is instilled with that one moment and that brings a vision as vivid as when it was first experienced. And now I have a moment to remember, and one I will not forget: spending an afternoon lost in time with my special friend Garen Ewing viewing bits and pieces of our special girl Edna. Janet Corbett - British Film Library and our 'niche'. Garen and I would like to thank Janet Corbett and her staff at the BFI Library for sharing their office space for our special look at Ednas Collection. Thank you Janet! And thank you Garen for sharing an unforgettable day with me and helping me through the streets of London. Rainbow Orchid t-shirts, prints, posters and much more! role in Garen's 'A Woman of Paris'. lost film production of Charlie Chaplin. The Chaplin Festival from the Royal Festival Hall!